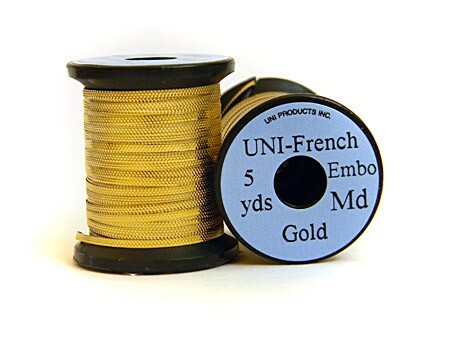 The UNI-French Embossed tinsels comes in two sizes .05" (Medium #10) and .038'' (Small #12) and 3 colours. A flat embossed tinsel used in mainly traditional salmon flies. Tinsel bodies and ribs come alive when this amazing material is used. Comes in three sizes. Lead wire is a must for those small nymphs to get them down that little bit deeper. Dual Mylar flat tinsel, two colours one on one side, another on the reverse. Uni Holographic Rainbow Mylar - superb flat mylar tinsel in an outrageous rainbow pattern. 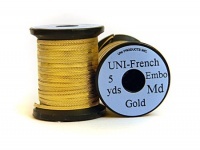 Strong flat pearl mylar has many tying applications. Comes in three sizes.